So my trip to Pierre and the South Dakota State Archives wasn’t as thrilling as I hoped on the research end of things. The Archives was fabulous, but records they had for Fort Sully weren’t terribly exciting or in depth. I think part of the problem is that the first Fort Sully only stood for three years so there is little information about it. The most exciting find at the Archives was a hand-drawn illustration of the fort by Private William S. Peck himself! Yes, “my” William! I will be ordering a scan in the next week or so and I hope to post it here. It is a beautiful drawing of the fort a bit at a bird’s-eye view looking from the Missouri River. The illustration is partially in color, with the use of some reds and blues. There is an large eagle accompanied by flags, guns, cannons, and a bugle which includes a banner touting Company D of the 30th Wisconsin, and “Bello vel Pace [Paci]” translated to “War or Peace.” The scene includes details of the fort structures along with out buildings and teepees and people situated along the banks of the Missouri. Since Old Fort Sully no longer stands, I was encouraged to find some additional drawings and reconstructed plans of the fort. One in particular was quite helpful. The drawing shows the location of the barracks, hospital, guard house, doctor’s quarters, commissary, officer’s quarters, the well, interior walkways, and the flag pole. It also indicates sites outside the fort walls including a dance hall, indian homes, the interpreter’s house, and stores. I will redraw the plans when I post the illustration of the fort by William Peck. The time Company D of the 30th Wisconsin stayed at the fort was limited. Post returns show they were only there a couple of months along with the 6th and 7th Iowa. Three officers were present in the month of June 1864 with Captain David C. Fulton as commanding officer, there was 1 medial officer and 65 enlisted men with only 54 were on duty, since 10 were sick and one that was arrested. Hmmmm, arrested for WHAT? The records don’t reveal the crime, darn it! A small monument is the only evidence that a fort ever existed at this location. There is a little children’s museum here, but all I saw inside were play exhibits of wildlife. It really isn’t surprising no mention was made of a contentious past. Fort Sully monument located where the flag pole stood at the center of the fort. Vertical marker at the right located the southeast corner of Fort Sully. 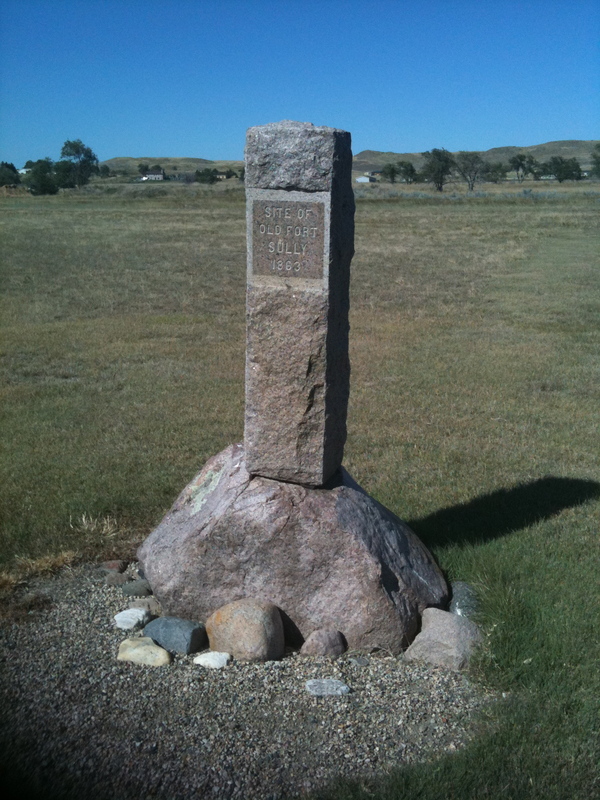 The stone marker can be seen near the center near the children't museum. Overall I’m glad I made the trip to Pierre, however it would have probably been much more satisfying if it was the first stop on a much longer road trip. I hope to get up to Fort Totten in North Dakota soon. Now THAT will be a much more inspiring trip considering a majority of the fort still stands! If you have read my background about Joe, you will know that I believe he co-opted Civil War and Indian fighting stories from the military experiences of his brother Samuel and step-father William Peck. 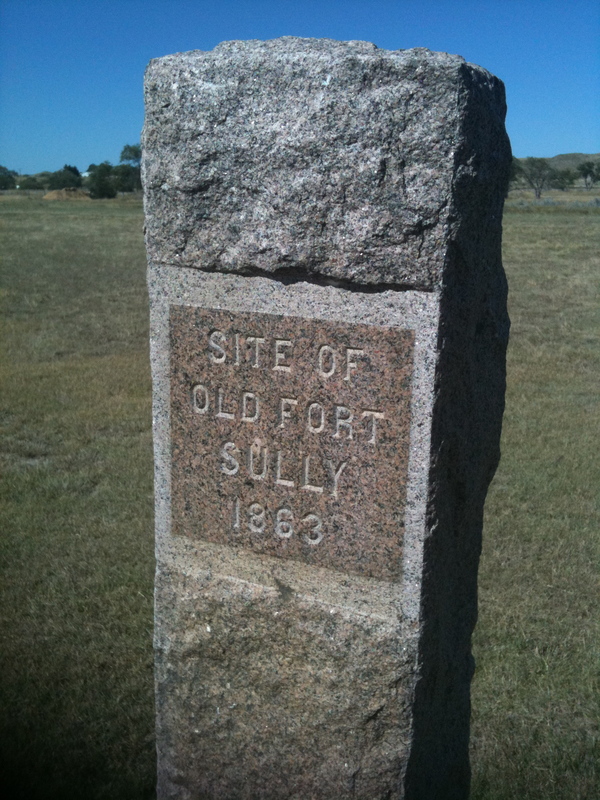 This week I was on the hunt for some of William Peck’s activities during the Civil War, specifically his connection to the building of Fort Sully in Dakota Territory in 1863. Several of Joe’s Indian fighting claim surround the military regiments associated with this fort, so I hope that my adventure will uncover some leads and clearer connections. You can read more about William on his bio page, but here’s a quick military intro. William enlisted in Company D of the 30th Wisconsin Infantry in August 1862. The following spring brought orders that took his company to St. Louis, Missouri where companies D, F, I, and K guarded supplies and support General Alfred Sully on his Northwest Indian Campaign. In August 1863 William and his company were transferred up-river and assisted with the building of Fort Sully located near Farm Island along the Missouri River just a few miles east of modern-day Pierre, South Dakota. So off to Pierre I went! During my eight-ish hour drive through northeast Colorado, central Nebraska, up to the center of South Dakota, and finally to Pierre, it was really easy to get a sense of what the landscape was like nearly 150 years ago. Easy, because I don’t think the landscape has changed very much apart from the roads, fences, and the occasional cell phone tower. Somewhere in the middle of South Dakota. The majority of my drive looked just like this. 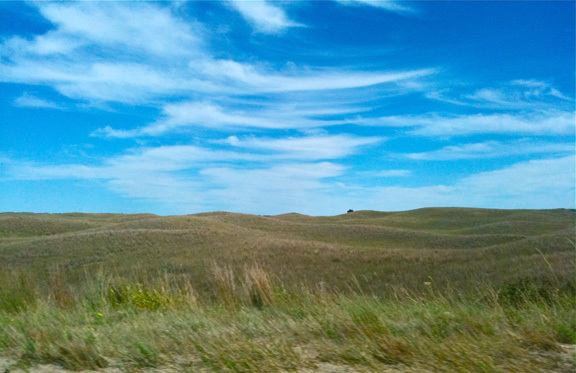 Nearing Fort Pierre, South Dakota. There are inklings of things green in the gullies that probably run with water in spring. Between the periodic small towns, the rolling hills were filled with prairie grass, endless corn or hay, acres of sunflowers, or a distant line of cottonwood trees identifying a small creek. 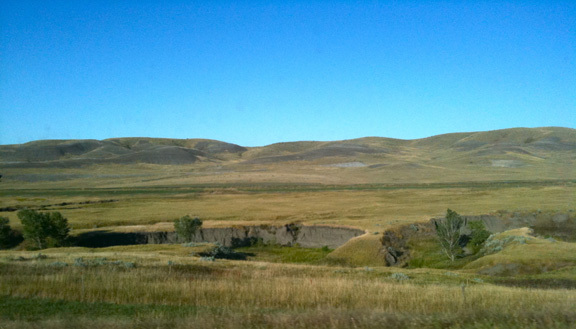 It wasn’t until I neared the Missouri River and Pierre did I see a vast amount of vibrant green trees again. The goal of this research trip was to learn what I could from the South Dakota Archives about the first Fort Sully and the men who lived there or passed through. Yes, there was more than one. The first fort was built quickly in the summer of 1863 during the campaigns led by Generals Sully and Sibley against the Sioux in Dakota Territory. 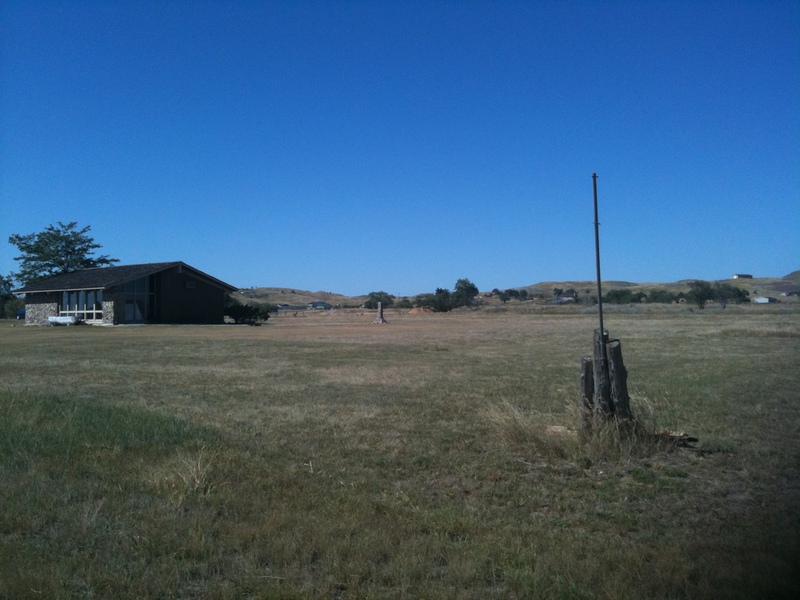 This was the fort William Peck helped to build, but it only stood for three years. The location of the fort was not optimal. 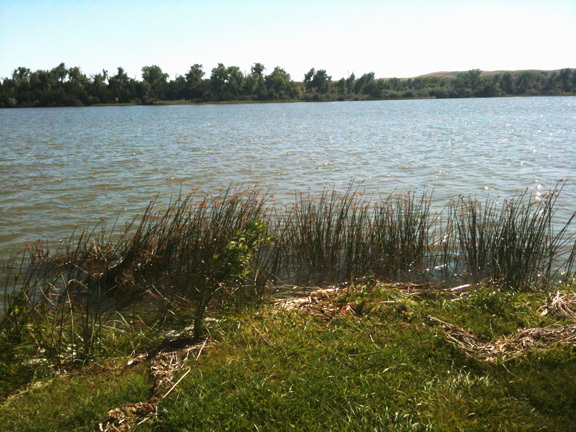 It was in a low-lying marshy area next to a small inlet off of the Missouri River (now known as Hipple lake). During those three years the soldiers suffered from disease and damp conditions. The first year was particularly harsh due to the lack of food, especially vegetables and fruit, and many of the men suffered from scurvy, including William. Even today the area is quite marshy. View is looking south across Hipple Lake with Farm Island in the distance. Trees from the heavily-wooded island were cut down for the construction of the fort. By 1866 the structure was in such disrepair that the commanding officer wrote that it was “hardly made habitable during cold weather…a few of the men’s quarters [were] high enough to permit me to stand erect in them…and the whole place is over run with rats, fleas, bed bugs and other vermin.” (1) So the old fort was disassembled and new Fort Sully (or Fort Sully II) was built about 25 miles north of Pierre. (1) Commanding Officer of Fort Sully, Dakota Territory, to Lieut. H G. Litchfield of the Head Quarters of the Department of the Platte in Omaha, Nebraska Territory, letter, 25 June 1866, discussion of quality of work and life at Fort Sully; Building Fort Sully I, Harold H. Schuler Papers, 1989-1993, Boxes 5973-5974, South Dakota Archives; original letter held by the National Archives.